Texas streams are under stress as the state struggles to balance environmental and economic water needs. 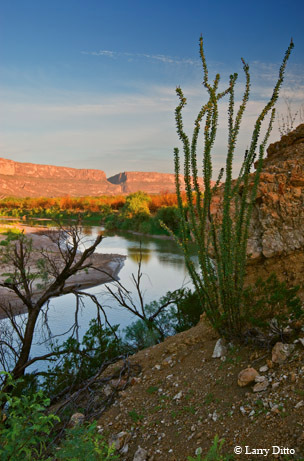 We camped on a sandbar in Santa Elena Canyon. 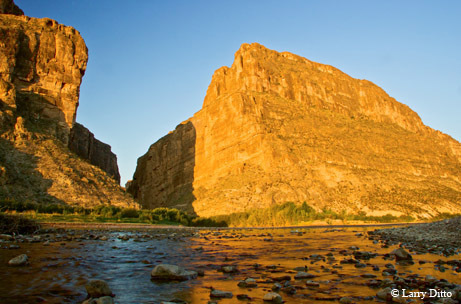 The sheer 1,500-foot walls of the spectacular gorge on both sides of the river we Americans call the Rio Grande rendered our view of the sky a narrow, winding ribbon of blue far above. At twilight a peregrine falcon swooped down between the ramparts and snatched a Mexican free-tailed bat right out of the air. After the dinner dishes were washed and put away, the ribbon over our heads deepened to a richer hue, now spangled with countless stars. Pleasantly tired, we savored the afternoon’s run. The river flowing through the canyon was challenging enough but presented no serious danger to us in our canoes. In the campfire’s glow, we savored our anticipation of the day to come. The strong currents of this great river would take us through the challenging formation known as the Rockslide and ultimately out of Santa Elena into the Chihuahuan Desert sun. We never dreamed that the day would come when there would not be sufficient water in the river for such an adventure to be possible. Our run was but a small stretch of one of 3,700 named streams and 15 major rivers that wind through nearly 200,000 miles of Texas countryside. Along the way, this vast circulatory system of our state provides water for almost 200 major reservoirs and ultimately flows into seven coastal estuaries to nourish one of the most prolific coastal ecosystems in the world. Unfortunately, that system is threatened today as never before. According to the Texas water plan, the population of Texas is expected to more than double between 2000 and 2060, growing from 21 million to 46 million. Although we are faced with the enormous task of providing life-giving water to all these new Texans, we have already given permission for more water to be withdrawn from many of our rivers than is actually in them. To put it another way, if all the water rights permits currently issued were fully used, some of our most beautiful and important Texas rivers would actually be dry today. Now consider that we will have twice as many people who need water in the next generation. These rivers are important to us. We’ve used them for navigation, to generate electricity, to carry away our waste, to irrigate our farmlands, to provide us with recreation and much more. Although we have relied on rivers for many ecological and economic services, we have done little to ensure that water will remain for fish and other aquatic creatures, for beauty and serenity, for recreation and the environment. Population growth and other factors — including the increased groundwater pumping that threatens to dry up the springs that nourish Texas rivers — promise to strain rivers as never before and potentially even dry them up. As inconceivable as this frightening specter may be, we have witnessed the mighty Rio Grande with so little flow that it no longer reached the Gulf of Mexico. It was not until the mid-1980s that the State of Texas began putting environmental conditions on consumptive water rights permits, and by that time, most of the water in our rivers had already been spoken for, says Cindy Loeffler, water resources branch chief for the Texas Parks and Wildlife Department. Against this bleak backdrop, the Texas water world was shaken on its axis when a grass-roots organization of river enthusiasts, the San Marcos River Foundation, filed for a permit before the then-Texas Natural Resources Conservation Commission that, if granted, would have committed the remaining 1.3 million acre-feet of unappropriated water in the Guadalupe River basin to stay in the river forever. Reaction was swift and harsh. Critics called the application a thinly veiled effort to limit growth in the region. Something akin to panic spread among those with interest in that water. Quickly, legislation was filed in the Texas Senate to make such permit applications by nonprofit conservation organizations illegal. Cooler heads prevailed and Lt. Gov. David Dewhurst called for a study involving legislative leaders from both houses (as well as stakeholders, including environmentalists and economic interests), with a mandate to return to the Legis­lature with an agreed-upon plan to address what was suddenly, thanks to the San Marcos River Foundation, a rather urgent issue. The heart of the issue was how to maintain the economic uses of Texas rivers while protecting the “environmental flows” that nourish the life within them. The San Marcos River Foundation’s permit application was denied by the Texas Commission on Environmental Quality in 2003, but that same year, the Legislature formally created a 15-member study commission that, after years of meetings and negotiations, came to a consensus on a plan to protect environmental flows in our rivers and streams. The results of the environmental flows negotiations, which were affirmed by a second panel, were subsequently embodied in Article 1 of Senate Bill 3, passed by the Legislature in the spring of 2007. The act, among other things, established an aggressive sequential schedule that called for setting environmental flow standards two river basins at a time. Starting with the Sabine/Neches basin and the Trinity/San Jacinto basin, the process was designed to establish criteria for both instream flows, the amount of water needed in a stream to protect habitat, water quality and recreation, and freshwater inflows, the amount of water flowing into a bay or estuary necessary to maintain its ecological health. A key reason for the expedited process was the realization that a number of pending water rights applications awaited decision by the Texas Commission on Environmental Quality. What little water remained would likely be designated for other uses in the absence of any environmental flow requirements. A unique feature of the Texas environmental flows process (as laid out in Senate Bill 3 and now part of the Texas Water Code) is that it is scientifically informed. A statewide Environmental Flows Advisory Group has been established to oversee the process. Texas Parks and Wildlife Commissioner Karen Hixon is a member of this group. The Environmental Flows Advisory Group has appointed a statewide Science Advisory Committee and also appoints stakeholder committees for each river basin. These groups of stakeholders, called Basin and Bay Area Stakeholder Committees, represent both environmental interests and economic interests, including agriculture, industry and municipal interests. Once constituted, the stakeholder committees select an expert science team for the basin to advise them. Through a process that mandates input from the public and technical support from each of the state agencies concerned with water — the Texas Commission on Environ­mental Quality, the Texas Water Development Board and the Texas Parks and Wildlife Department — environmental flow recommendations are submitted to the commission for adoption as legal rules. The stakeholder committees are charged with reviewing recommendations from the expert science teams and considering them in the context of other factors, primarily present and future water needs for purposes other than the environment. 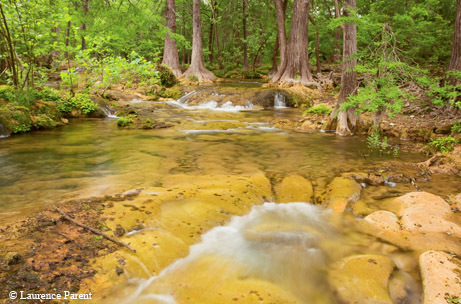 The expert science teams are to consider only science in determining the amount of environmental flows needed to maintain a sound ecological environment in Texas rivers and streams. The science team report, which forms the basis for stakeholder recommendations, is submitted directly to the commission without edits or amendments from stakeholders. Based on the two reports and on input from the public, the commission is charged with rulemaking to establish legally binding environmental flow standards for each bay and basin. Another unique feature of the process is that it incorporates a concept known as adaptive management, which assumes that new knowledge may come forth concerning the needs of our rivers and allows for the standards set by the commission to be reviewed at least every 10 years and revised as necessary. To date, following the sequential schedule laid out in Senate Bill 3, recommendations have been submitted to the commission for the Sabine/Neches/Sabine Lake system and the Trinity/San Jacinto/Galveston Bay system. In the Sabine/Neches basin, according to Hess, stakeholders concluded that more study was needed before they could recommend environmental flow regimes. Though a report was filed late from the stakeholder group, the commission staff had substantially reduced the science team’s recommendations in its proposed rules. The good news is that things look much better in the next two rivers in the Senate Bill 3 process, the Guadalupe and the Colorado/Lavaca. The expert science teams have completed their work, and both reached consensus, coming forth with a unified set of recommended standards. Additionally, the stakeholder groups in both basins are working together well, and the prevailing attitude seems to be that a strong positive outcome will result. At the same time, TPWD scientists under Loeffler’s direction are fully engaged in the process, and the department’s efforts on behalf of both the ecological health and the recreational use of Texas rivers have greatly increased. These are positive signs and come none too soon. The rivers of Texas deserve no less. Recently, I returned to Santa Elena Canyon, where there was so little water flowing that we had to put in at the mouth, normally the end of the trip, and paddle upstream to the Rockslide in the still pool of water that is all that remains of the river there. The canyon is still magnificent, and though we were again humbled to be back beneath the lovely ribbon of sky, the flowing Rio Grande is gone, and somehow the great canyon has lost its soul.